Through the efforts of KARS (Kankakee Area Radio Society) members Howard Dybedock, AK9F, and Jerry Rosalius, WB9Z, the local area now has two full time National Weather Service VHF transmitters. Howard and Jerry have been working for about six months to convince the weather bureau to locate transmitters here, as the closest VHF weather radios (Chicago and Champaign, both on 162.550 mHz.) lacked the power to penetrate buildings, and often interfered with each other. But recently, Congress provided a new funding allocation which enabled the NWS to buy the equipment to serve additional counties and the Bureau agreed to add stations to our area. Each operate 24 hours per day, every day, sending out weather forecasts and weather conditions around the Midwest, and also immediate warnings of severe weather conditions heading toward Kankakee and Iroquois counties, such as may come from our weather spotter effort. 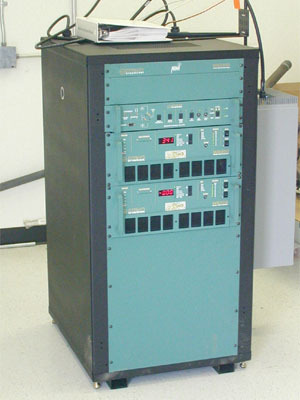 Originating at the National Weather Service at Lewis University Airport in Lockport, Illinois, the stations are currently transmitting the computer generated voice of “Perfect Paul”, the somewhat maligned voice synthesizer which doesn’t sound exactly human. Within the next six months or so, the National Weather Service has promised that a much superior computerized voice will replace “Paul”. The Kankakee County transmitter transmits on 162.525 MHz. at the 350-foot level of the WVLI tower, between Aroma Park and St. Anne. The Iroquois County unit on 162.500 MHz. is located on Jerry’s 500-foot tower just North of the home QTH at WB9Z, 3 miles South of Crescent City. Both stations transmit with 300 watts and use high gain antennas that generate an effective radiated power of approximately 850 watts. (This compares to 277 watts for the W9AZ 2-meter repeater) So the range of these stations will be quite large. Howard, AK9F, has been working with Craig Williams of the Milwaukee office of the NWS to install new stations at Rockford, Freeport, Dixon, Crystal Lake, Plano, Galesburg, and Bloomington, as well as about 20 systems in downstate Illinois, Missouri, South Dakota and Kentucky. The equipment is manufactured by Crown Electronics in Elkhart, Indiana, and each station costs about $50,000. The high power is utilized in order to get maximum building penetration into schools and other public buildings so the signal can be heard in unsophisticated radios. Radio Shack and other stores sell small desktop radios that pick up the VHF weather stations but remain silent until the Weather Bureau transmits the activating tones. Nearly every school in the area and many public buildings will have the radios in order to stay atop the weather situation, particularly during the tornado season. KARS members have been working with the local ESDA to program the radios that are then sent to the schools.